Hey there! I hope you're having a good week. Our Spring Break is in progress now, and we're enjoying that very much. I've been crocheting up a storm; we've mostly stayed home and I've been able to get some much-needed rest and relaxation after a crazy few weeks. Yesterday was stormy and cold, which was perfect for staying in, eating soup and drinking tea, watching a movie and working on my blanket. Just wonderful. This morning, I went to the dentist for a check-up and cleaning (a good report, thankfully), and this afternoon, we'll go to the GB's ballet lesson. I was secretly hoping we'd get a week off, but they're staying open for classes during the break. Tomorrow, I'll go to the store for our Easter ham and white eggs for dyeing. Today, I want to show you how I've been joining my hexagons. I've chosen to join them as I go, just because I really like to watch the progress as the blanket takes shape, and also because I don't enjoy sewing or crocheting them together later. Sewing motifs is particularly fraught for me; I never seem to be able to estimate the length of yarn I'll need to sew motifs together, and I end up with more ends to sew in. Crocheting them along the edges hurts my hands after a while. So JAYG works best for me. I looked for a tutorial on JAYG for hexagons, but I wasn't totally satisfied with what I found. This is how I've been doing it, which is not say it's my invention, just what is working well for me. For the body of the hexagon, I'm following a basic six-round granny hexagon pattern from a blog called Novamade; Nova's hex pattern (click to see it) is simple and easy to follow. Following the pattern, I'm making one chain between clusters on the sides, but in the outer cream round, I've added a chain in the corners, for a total of two chains. This gives more space for joining at corners. I'm joining my hexagons in horizontal rows. As with any JAYG method, start by making the outer round on one hex, then join them one at a time in a strip, joining the left-hand side of each hex to the right-hand side of the one before. Once you have the desired number of hexes joined in your first row strip, move on the next row. Hexagons will need to be arranged in a staggered way, like a honeycomb. You'll have long rows alternating with short rows. I'll show you how to make half-hexagons another time; these can be used to fill in the spaces along the sides created by the staggered rows. My blanket has eight hexes in the long rows and seven hexes in the short rows. 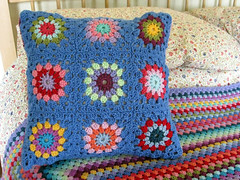 I'm going to show you how to join a motif to the ones above it, and if needed, the one to the left of it. Start with the right-hand corner above the straight edge. Chain 3, one double-crochet in the purple corner space, followed by one chain. (This would be the same way to add the first hexagon in a new long row; you'd just join it on this side and continue all the way around the hexagon to complete the border round. In a short row, you'd need to join both top angled sides). Slip stitch into the corner space of the hexagon above, then make two more dc into the purple corner, to complete the corner clusters. Then sl st into the next ch above. Continue along the side of the hex being joined, making 2dc in each space and a sl st into each ch above, until you reach the next corner space. This is actually where three corners will meet: the corner of the hex you're joining (purple), and two above it - one from the hex you've been joining to (red), as well as the one to the left of that hex (teal). Make 2dc in the purple corner. Now sl st into both of the corner spaces above. I've numbered the spaces: first, do the right one (red), right above your hex being joined, then do the left one (teal). This is different from JAYG with squares, where you would join only to the square above and the square to the left, not the one diagonally above to the left. Do you know what I mean? Here, you're joining all three corners. Once you've sl st to both corners above, make 2dc into the purple corner. Then sl st into the ch space to the left of the teal hex's corner. Continue down this side until you reach the next corner - 2dc in each space, sl st into the ch space above. Just as you did at the previous three-way corner, sl st into the right (dark teal) corner, then the left (light teal) one, and then make 2dc into the purple corner. Sl st into the ch space above, and continue down the side (you're joining the left-hand straight side now), making 2dc into spaces and sl st into ch spaces above. Now you've reached the lower corner of the left straight side, and you need to join this corner to the corner of the hex to the left. Make 2dc into the purple corner, followed by one ch. Make a sl st into the ch space of the light teal corner, then 2dc into the purple corner. Don't sl st into the next space like you did before; now you're done joining this hex and you're going to crochet the rest of the round along the other three sides. Continue along the next side of your hex, making 2dc into each space with a ch between each 2dc cluster. For all of the remaining corners, add a ch in each, for a total of 2ch in each corner. When you reach the original corner, sl st into the top of the ch3 from the first cluster, fasten off and weave in ends. Join the next hexagon in the same way, starting with the upper right-hand angled edge of the hexagon and continuing around all sides. I hope this tutorial makes sense. Pattern-writing is not my forte, but I've been asked several times for tips on joining hexagons since I began sharing this blanket on my blog. I just want to help you visualize the method, but please feel free to ask questions or let me know if something is unclear. Joining hexes is really easy once you have the hang of it. Think of it this way: all you're doing is joining each side, and corner, that touches another hexagon. I've given a detailed description of joining hexes in the middle of a row, but end rows are even simpler: for the final hex in a long row, you'd start with the top point of the hex, since there's nothing to join the right side to. You'd be joining on just the top left angled side and the left straight side, continuing the border around the rest of the sides. 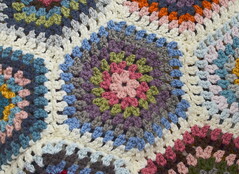 Always make 2ch in the "free" corners so that there's space to join another hex, a half-hex, or add a blanket border. Start with right-hand corner above straight side. In starting corner, ch3, 1dc, ch1. Sl st into corner above, 2dc into corner space, sl st into ch above. First angled side: 2dc into next space, sl st into ch above, repeat until next corner. Three-way corner: 2dc into next corner, sl st into corner space above (right corner), sl st into left corner, 2dc into joining corner, sl st into ch above. Second angled side: 2dc into next space, sl st into ch above, repeat until next corner. Straight side: 2dc into next space, sl st into ch above, repeat until next corner. Next corner: 2dc into corner, ch1, sl st into corner to the left. Remaining sides: 2dc into each space, ch1 between clusters, 2dc, ch2, 2dc in each remaining corner. Continue until starting corner, sl st into original ch3, fasten off and weave in ends. I much prefer joining as you go when I making blankets. I detest sewing them one by one when all the squares or hexies are done. You did a lovely job with the tutorial. I’m glad your dentist visit went well and I hope your spring break continues to be relaxing and fun. Your blanket is going to be pretty. The white joining them makes the colors pop! I love the colours you're using, that teal and the orange especially. I'm not a lover of joining motifs together so joining as you go works best for me too. Thank you very much for sharing this tutorial! You're very kind ! 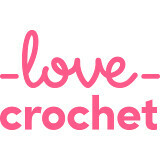 We watch a lot of Netflix in our house and it's a great crochet time when watching TV. Happy Easter!